I will be going over how to install XBR and Xell onto your Xbox 360. Installing XBR allows you to do many things such run unsigned code(homebrew), install any sized hard drive(even 3.5in desktop hdds! ), ftp into your box, and custom dashboards. There are endless possibilities with being able to run any code you want. You are able to modify Xbox 360 games to run custom maps and cheats. You can also launch games off the hard drive without a disc. It should cost you around $5 in parts, maybe even free if you have the parts already. Your kernel must be kernel 2.0.7371.0 or lower for this to work. You can do this by opening up the system info tab. After there is one more step to check if it still is exploitable, but you have to build your cable to dump your nand first. Refer to the image below to tell what kind of 360 you have. There has been a new update to the standard wiring you should use for the JTAG wiring on Xenon's which requires just 2x 1n4148 diodes. I've never used this method before so I can't really help as much if you have problems. But I would suggest going with it instead since it is supposed to be electrically superior and uses less parts so less room for failure I guess. Soldering is generally pretty straight forward. You actually don't need any solder for the motherboard end, as the holes all have solder in them. So you just need need to heat it up and slide the wire through. I suggest using at least a 30w iron as a 15w will have trouble getting the lead free solder hot enough. All resistors on the connector are optional, it's just to prevent damage as some ports are 5v and the motherboard is 3.3v. Recently there has been a new way to wire Xenons that is supposed to be better, I have never tried it but I have included the diagram on how to wire it. Plug your Xbox 360 in, but don't power it on. Type nandpro lpt: -r16 nand2.bin and dump it a second time. If during the dump it has trouble reading blocks, don't worry. You only have a problem if can't read block after block, which means something went wrong in the middle of the dump and you have to restart it again. If you are having issues having nandpro detecting it, go over and double check all of your soldering. If you skipped out on the diode, try adding one, and just restarting your computer has fixed the issue quite a few times for me. You also want to make sure your cable is short as possible. You're going to want to open up degraded included in the file pack. Go to settings and under 1BL key make sure it says DD88AD0C9ED669E7B56794FB68563EFA and is checked. You are also going to want to change file system start to 39. If your CB is the following you're in luck! If you are unsure if yours is exploitable, you can also check if CD = 8453, if it does you're out of luck. 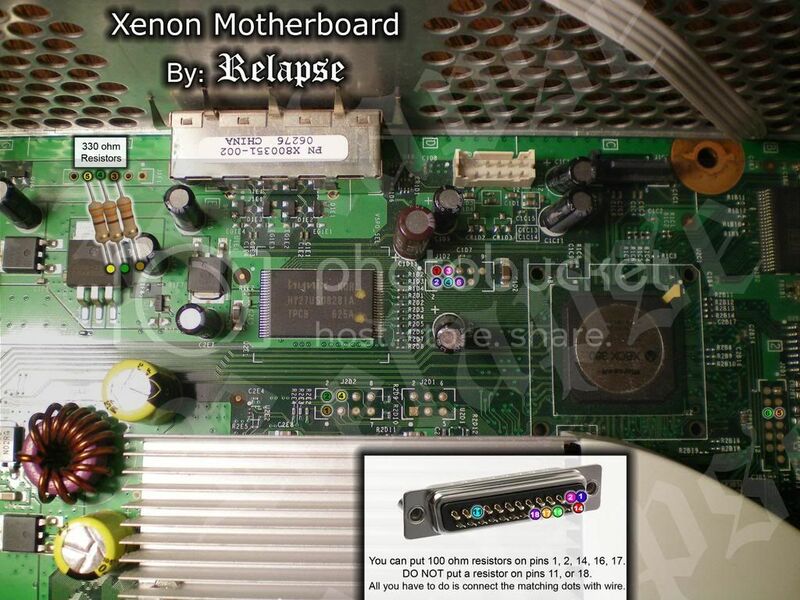 Select the proper XBR for your motherboard included in the rar file and put it in your nandpro folder. Rename it to xbr.bin to make things easier. Reassemble your 360, and boot your 360 with the DVD drive ejected. Or if you don't have a DVD drive you can plug in a wired controller into the back usb port. You should see a blue screen pop up and whole bunch of things fly by. When it says CPU fuses, your either going to want to write really fast or snap a picture. fuseset 3 and 5 or 4 and 6 is your cpu key. I included quite a few extra programs in the .rar file. A lot of them will come in handy with your Xbox 360 homebrew experience. I'll be going over what each program is good for. This tool allows you to view all the files in your nand and your keyvault. You need your CPU key for this. This allows you to modify the region code, or what your DVD drive key is. If your Xbox 360 DVD drive is missing or you burned yours out, this is the tool you need to recover it! You can either change the key to someone simple as just 1's or what it originally was. Since you can run any code now, you can patch .xex game files. With this tool you can remove region coding from games and many other things. This will allow you to unlock any DLC, or XBLA games you may have that are demos and that are signed to a certain console. You can download game demos on the Xbox marketplace and unlock it with this tool. This tool allows you to view the content of an Xbox 360 Iso image. What I use this tool for is extracting the files from the iso then putting them on my xbox instead of the iso. Xbox 360 iso's are zeroed out to 7 gb or so no matter how big the game is. A game with 1gb of files could be wasting 6gb of space. This program allows you to modify the console ID on DLC, and XBLA games to run on any console. This is a xbins autoconnect tool. Use this to download the latest files. This is my favorite Xbox 360 custom dashboard. It includes DVD ripping and FTP support. It is one of the most progressing dashboards that is constantly being updated with new features. This tool creates containers from xex files that can be launched from the dashboard. This allows you to navigate your hdd on your xbox and launch .xex files directly. It also has an ftp server running in the background also. I included 2 versions, one is the ISO which you just burn to a CD and put in your xbox, the other is a XBLA file that you put in your content folder on your hard drive and launch. This requires you to cut the end off a sata cable and solder it under the HDD connector. The side of the sate cable with the writing goes up, and you start left from right. You only have to solder the white shielded cables inside as these are the data cables. Just wire the rest of the ground wires some where else. Where to get my 12v? There are many spots on the Xbox motherboard where you can get 12v of power from, I picked the power connector on the bottom of the board as I'm not soldering onto any other connectors or anything. Hard drives have been tested up to 2tb and worked successfully. Step 10: My Avatar Is Only a Silhouette! Usually your avatar will be a blank silhouette and it will tell you, you need to install an update to use them. All you need to do is download this update file, and place it on a USB flash drive, and plug it into the back usb port of your xbox. Your 360 should detect it and install it. Make sure you extract it first and the root of the drive is the $SystemUpdate folder. You can also burn it to a CD to update. 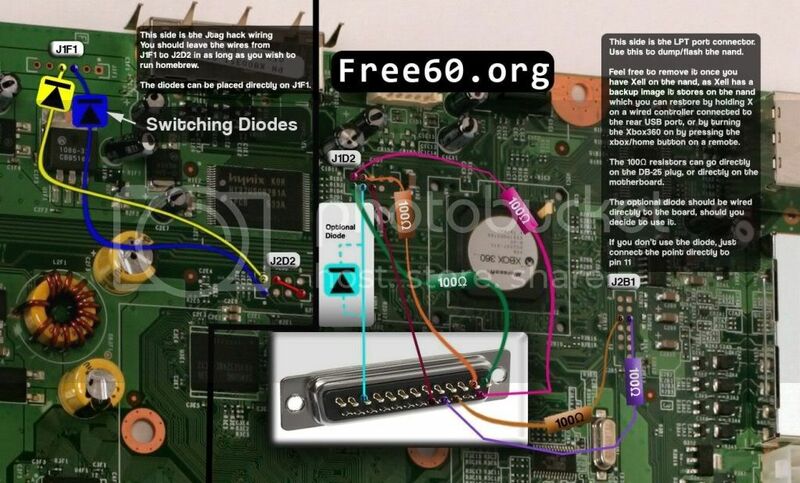 If you're paranoid you will brick your console because microsoft is out to get you and ruin your homebrew, you can look at the picture about removing the r6t3 resistor to keep from having your fuses blown. I also provided a mediafire mirror in case the microsoft one goes down. On step 2 it says that you need 3x 330 ohm resistors for Xenon, but on pictures for Zephyr, Falcon, Opus or a Jasper u need also some 100 ohm resistors. So are those important or ....? Hey guys. On the step 1, finding out if my Xbox360 is Exploitable; I just checked mine and my Dashboard says: 2.0.16202.0 Please does this mean it can not be Jtaged and please is there any other way...??? The Link for the Main Files is dead. Could you Repost it ? First Can the LPT port have to be embedded or can it be done through a USB to LPT interface? Second Can the LPT port on the computer's side be switched/substituted for an MCU (Micro Controller Unit like Arduino UNO or MakeBlock Orion) that interfaces between the LPT cable and the computer? Is there a way to mod Xbox 360 S without using a devkit? 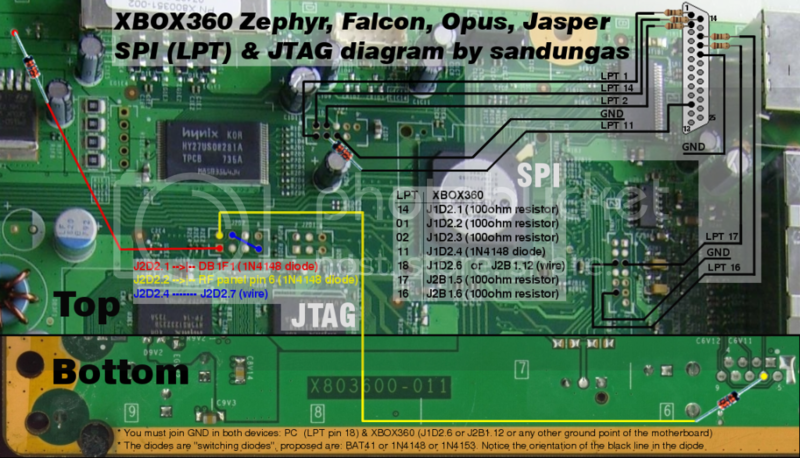 Could you use a jtag? I can't seem to find any tutorials on how to jtag a xbox 360 s.
Also the last xbox I owned got red ring of death and I took it apart to try to fix it and it broke completely. Yeah, it still worked a little bit even though it had the red ring. This is cheating. FYI you could be banned for this if caught BTW. Can you or someone post the list of the programs to download? Your mediafire link is dead. What if your dashboard is at 2.0.17502.0 Will that's work ? Is 2.0.17502.0 lower than 2.0.7371.0? That's your answer.